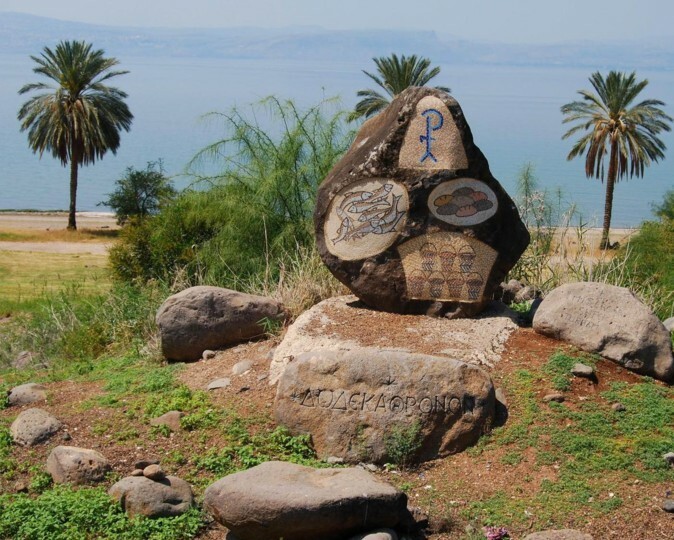 Tell Hadar is located on the northeast side of the Sea of Galilee, in the "midst" of the coasts of Decapolis (as described in Mark 7:31). According to the Gospels, Jesus sailed across the Sea of Galilee, landed in Decapolis, and fed 4,000 hungry people with just seven loaves of bread and a few small fish. The topography of the site and the proximity to the nearby major Roman road makes this tradition sound reasonable. The photo above shows a modern monument that commemorates the place of the miracle, which is located on the west side of the Tell. The pictures show the seven loaves of bread, the seven baskets that the disciples filled with leftovers after the meal, and the small fish. The Greek word ("Dodeka Thronon"), inscribed on the stone, means "Twelve thrones". This is a passage from Matthew 19:28 referring to the twelve apostles: "And Jesus said unto them, Verily I say unto you, That ye which have followed me, in the regeneration when the Son of man shall sit in the throne of his glory, ye also shall sit upon twelve thrones, judging the twelve tribes of Israel". Mark 8:1-9: "In those days the multitude being very great, and having nothing to eat, Jesus called his disciples unto him, and saith unto them, I have compassion on the multitude, because they have now been with me three days, and have nothing to eat: And if I send them away fasting to their own houses, they will faint by the way: for divers of them came from far. And his disciples answered him, From whence can a man satisfy these men with bread here in the wilderness? And he asked them, How many loaves have ye? And they said, Seven. And he commanded the people to sit down on the ground: and he took the seven loaves, and gave thanks, and brake, and gave to his disciples to set before them; and they did set them before the people. And they had a few small fishes: and he blessed, and commanded to set them also before them. So they did eat, and were filled: and they took up of the broken meat that was left seven baskets. And they that had eaten were about four thousand: and he sent them away. And straightway he entered into a ship with his disciples...". Matthew 16: 5-12: "And when his disciples were come to the other side, they had forgotten to take bread. Then Jesus said unto them, Take heed and beware of the leaven of the Pharisees and of the Sadducees. And they reasoned among themselves, saying, It is because we have taken no bread. Which when Jesus perceived, he said unto them, O ye of little faith, why reason ye among yourselves, because ye have brought no bread? Do ye not yet understand, neither remember the five loaves of the five thousand, and how many baskets ye took up? Neither the seven loaves of the four thousand, and how many baskets ye took up? How is it that ye do not understand that I spake it not to you concerning bread, that ye should beware of the leaven of the Pharisees and of the Sadducees? Then understood they how that he bade them not beware of the leaven of bread, but of the doctrine of the Pharisees and of the Sadducees".